Add the chopped onion, carrots, and celery. Cook the vegetables for about 5 minutes, until they are tender. Add the garlic and continue cooking until the onion is just starting to brown. Add the kale and zucchini to the soffrito and cook, stirring occasionally, for about 5 minutes or until the kale is wilted. 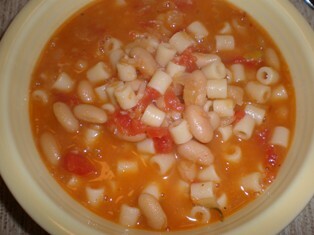 Stir in the beans, tomatoes and wine and cook for another 5 minutes, allowing the wine to reduce a little. Add the chicken stock and the sprig of rosemary, bring to a boil then reduce to a simmer and cook uncovered for about 40 minutes. Remove the pot from the heat; remove the rosemary sprig and discard. Add the bread cubes, stirring them gently into the soup. If the bread is too soft, dry it out a little in a 250-degree F. oven, before adding it to the soup, so that it doesn't disintegrate into the soup. 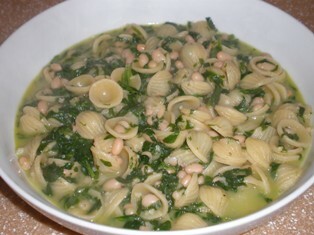 Allow the soup to rest for about 30 minutes, if you are serving it the same day. Serve warm with a dusting of Parmesan cheese and a drizzle of olive oil. To reheat the next day, bring the soup to a boil then remove from the heat and allow to rest for 5 minutes before serving. Ribollita means 'reboiled' because this Tuscan bean soup is best made a day in advance to let the flavors develop, then reheated. It should be thick enough to almost eat with a fork rather than a spoon. Lacinato kale, called cavolo nero, literally "black cabbage", is a traditional ingredient in ribollita. This variety of kale has a long tradition in Italian cuisine, especially that of Tuscany. You can substitute common kale or Savoy cabbage if desired. 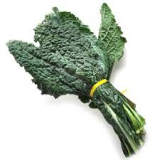 Lacinato kale, also called Tuscan kale or dinosaur kale has very dark blue-green and almost black-green leaves. The leaves are more hearty than common kale, so they hold up well in soups and stews but can also be sauteed like spinach. Extra-Large Clear Coffee, Tea or Soup Mug, 18 oz.